Whether your goals are cleanliness, sustainability, or labor efficiency, Original ecotrash® and ecotrash PTC® can help you get there. 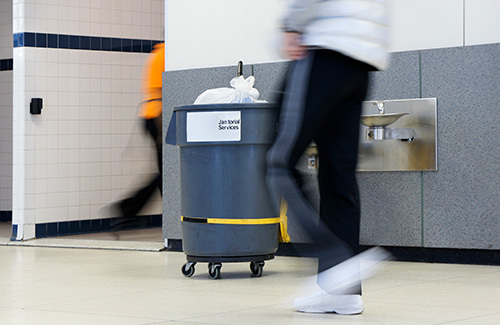 Eliminate over-flowing trash cans with the latest technology and minimize staff time to manage the issue. Original ecotrash provides a better solution than to increased staffing. 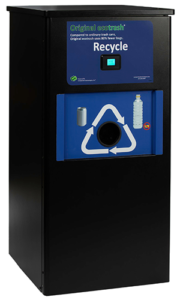 Original ecotrash and ecotrash PTC (paper towel compactor) increase trash container capacity. 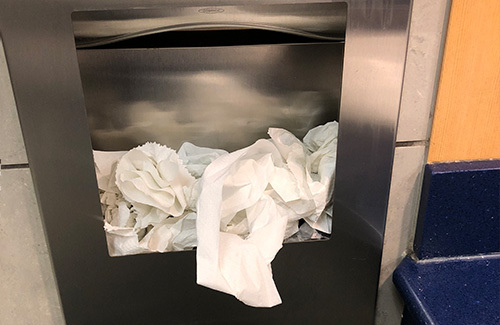 Compared to in-wall restroom cans, ecotrash PTC holds 20 times the paper towel volume. For waiting rooms, an Original ecotrash compactor holds eight times more than a 23-gallon Slim Jim. Liberate your team to focus on higher priority tasks. There’s no perfect way to force consumers to properly separate recycling from trash. But, Original ecotrash receptacles with a “Recycle” conversion kit restrict the size and dimension of trash deposits. The 4” round hole allows cans and bottles through, but prevents paper plates and clam shells from passing through. The transition from marked containers to compactors sends a clear message that you’re rethinking trash. How many hours per day is your staff hauling trash? Compacting trash at the point of deposit reduces the number of trash bags used and cuts down on the number trips to the dumpster. Original ecotrash compacts trash 6:1, and ecotrash PTC compacts paper towels 20:1. Same amount of trash, fewer trips. That means less time your staff spends transporting trash, waiting on elevators, pushing carts and lifting heavy, leaking bags.